Since before our little girl was born, I have envisioned what her room would ultimately look like. I imagine the colors to be yellow and lavender (or periwinkle) with a hint of pink, which is her favorite color. I have been thinking about a big girl room for her lately because we have finally donated the last of the crib bedding. At first, I was thinking about something delicate and pretty for the bed, such as a Laura Ashley-esque floral lavender and yellow comforter. 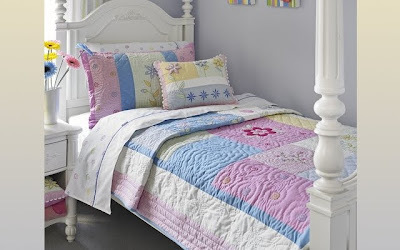 Then I thought perhaps something like this Freckles Daisy Chain Quilt might be better for a girl as young as a preschooler all the way up to a tween. It just seems less formal and more fun than a floral print would be. For all the casegoods, I picture everything to be a distressed white or winter white. I also envision a comfy accent chair or a chaise next to a floor lamp so that our daughter can sit and read under a soft cuddly plush throw. The Daisy Chain Quilt retails for $119 for the twin size on CSNStores.com. There are also coordinating shams, throw pillows, and an accent rug available to be purchased separately. I would love to have all the accent pieces to help pull the whole room together. Our daughter is very much a girly-girl, so I know that she would love it all too!